And there was e.k. on the other side of the street waving frantically. She thought we had said subway exit #2, not #1! The subway exits are all logically numbered so that you know on what corner of the intersection or street you will be exiting the underground at. e.k. is short for her Korean name. She simply prefers to be called "e.k.". She's a mid 30's career woman who doesn't have room to host couchsurfers, but she enjoys spending time with visitors in order to practice her English and show them around town. So, we decided to head to the coast to a recently built "Skywalk". She said that she had heard of it, but had never been so she wanted to see it as well. But when we got there, it was closed due to the inclement weather. Can't see why, but for whatever reason, it was closed. Didn't really matter because we all thought it was a little lame anyhow. The Oryukdo Skywalk near Igadae Park. Admission is free...but only when it's open! e.k. and Ruth near the closed gate of the skywalk. The skywalk doesn't really stick out that far. Opposite the skywalk is a huge apartment complex. They look fairly expensive, and of course many of the units would have a great view. But e.k. says they're actually fairly cheap because nobody wants to live there! She said they're actually too far away from the city itself. Looking out to sea from the area of the skywalk. Yes, it was a rainy day! So then e.k. said she would drop us off where we could do a short hike and she would wait in the car and do some work on her smart phone. We think she was using us as an excuse to play hooky from work today! That's fine by us! Plus, she didn't really have hiking attire with her. But by the time we got to the start of the trail, it was starting to rain much harder so we came up with another plan. She had asked how we were doing here in Korea, and we mentioned that food was a bit of a challenge and we explained about not eating wheat. So, she says "I know of a bakery that does all of it's baking using rice flour"...and she drove us over there! Ruth thinks she has landed in heaven! A little pricey, but we splurged on a few take out items for tomorrow's lunch! Then, e.k. suggested we go for lunch because we were close to a special place that she knew that does a dish called "bulgogi". It's like a ground beef bbq dish with all the typical Korean condiments, but it's a little expensive because beef is typically very expensive in Korea. But she wouldn't let us pay! Ruth and e.k. and our lunch spot. Kevin is better at sitting on the floor for eating, but Ruth is better at using chopsticks! No, there are no forks here. You get a spoon, and you get chopsticks. Korean chopsticks are metal and they are a little more difficult to use than the Chinese chopsticks that are typically wood. When we left lunch it was still raining, so we decided on the Busan Museum which is next door to the United Nations Memorial Cemetery of Korea. The museum itself wasn't the greatest. We've been to much better, and to be honest we're sort of museumed out! You can only stare at so many broken pieces of pottery! 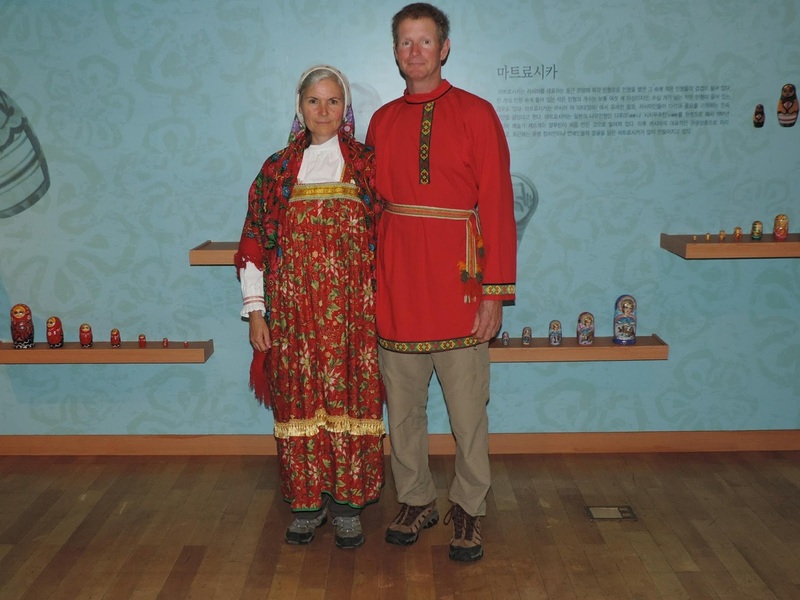 Ruth and Kevin, dressed as Russians! They had a temporary exchange display that contained articles from south eastern Russia. One area had some dress up clothes, so what better way to have fun on a rainy day. Does Ruth have a "Russian" look on her face. e.k. got dressed up too! From there, we went to the Memorial Cemetery. 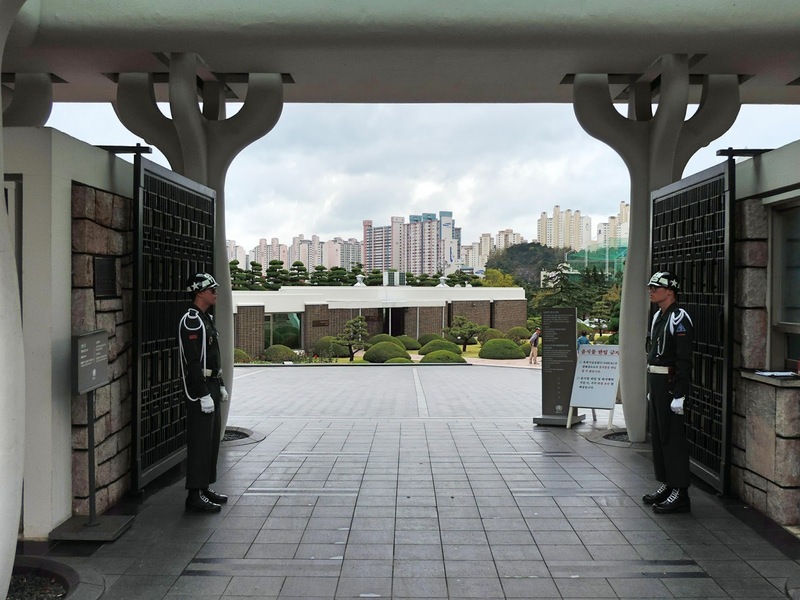 The United Nations sent a huge contingent of manpower to help fight the Korean War, and this cemetery holds monuments to all 16 countries who participated. The single largest UN contributor was the United States of America (USA) which at one stage had 140,000 personnel deployed in direct combat roles in Korea. Great Britain, Canada, France, Belgium, the Netherlands, Colombia, Ethiopia, South Africa, New Zealand, Turkey, Greece, Thailand, Philippines and Luxembourg sent fighting units. Norway, Sweden, Denmark, India, Italy contributed military hospitals and field ambulances to the cause. The Korean guards asked where we were from. We said Canada, and they smiled and went to tell the office. I think they simply keep track of where their visitors are from. The grounds are beautiful. Too bad it started raining hard shortly after I took this picture. There are over 2,100 soldiers buried here. It's a really well done memorial. Highly recommend that this place is worth a visit, especially for anyone who through there home country has a connection. They play a 10 minute movie in the worship hall (they did the English version for us) that explains how the cemetery came to be, and there's a memorabilia room that has some interesting photos and statistics about how many people from each country took part. We thought we were just about done, but e.k. insisted that she wanted to show us a popular Korean dessert. Okay! It's a very fine shaved ice, but it's made from milk. Not very sweet, and with almonds and bean powder! Then, you pour a sweetened milk on top of it. Delicious, but I would have had a hard time eating a whole one. We said goodbye to e.k., and she dropped us off right where she had picked us up. What a great afternoon we had...thanks e.k.! Then, we got a message from our couchsurfing host Kim, asking us to join his family for dinner. He said he would meet us at the studio apartment where we're staying, at 6:30pm. We thought we were going to his family's home, but we went to a nearby restaurant and met them there. His parents don't speak any English, but we had great conversation and a few laughs with Kim doing all of the translating. They were really interested in our trip to Africa and wanted to hear all about it. Dinner. The pork that looks like bacon is actually very thick strips and they cook right in front of you. A lot of Korean restaurant cooking is like this. They wouldn't let us pay for dinner either! People here are amazing. Actually, scratch that...people all over the world are amazing. Although the generosity of people in Korea does seem to overwhelm us. Then, they asked if they could take us on a night driving tour of the city. Okay! Again, Korean's are very good bridge builders. The light show on the Gwangam Bridge is amazing. The Busan Cinema Center is where the Busan International Film Festival was held earlier this month. They have a huge outdoor covered seating area to watch a movie! Can you see the size of the screen compared to Kevin? The bridge again, taken from Gwangam Beach. Looking down the beach at the lights. Busan is amazing at night. The city is lit up with so many colorful lights. We hope to be able to see it another night when the weather is better! Jim, Kevin, Ruth, and Sue. Kim's parent's are old school and have never had English names. They told us their Korean names and we suggested they sounded like Jim and Sue! So now they have English names! Wow. How to turn a miserable rainy day, into a fantastic day! Thank you so much Kim, Jim, and Sue...we totally enjoyed our evening with you! As Kevin said, we are totally overwhelmed by it. People here in Korea are very helpful and so friendly. Such a wonderful rainy day, glad you enjoyed it. It was an amazing day, although we could have done without the rain! Again, such good and educational pictures! Thank you! Thank you once again Kay! Ruth definitely has the old country Russian look. Kevin just looks like a Mountie without the hat! Haha, that's a good one Dugg! Never thought about it looking like a Mountie outfit! Very pretty city for sure!!! We can't get over the size of it! Unfortunately we don't have enough time to really explore it though. Thank Paul and Marti, we sure hope we get a chance to pay it forward ourselves even more. This is amazing to me - How awesome to meet such amazing and generous people! We were a bit nervous about meeting Kim's parents but it didn't take long for the feeling to fad away. We had so many laughs and got along with them so well. They are wanting to visit Africa and go on a safari so we are hoping that we could pass along enough information to help them out. We agree, meeting the locals and seeing how they live their lives is a very important part of traveling and we have certainly been getting our share of that. Jim and Sue definitely know where Saskatchewan is, we even showed them on a map. They want to learn English so we invited them to stay with us at the campground. Sure would love to have them come and visit. Koreans love to play host. What a great day of touring! Bulgogi, pork belly and snow ice on top of it all! Yes, they do love too! They are proud of their country and it's food and they love to share! Try as we might they wouldn't except any money from us. We had some wonderful pen sketched postcards of some of the most beautiful temples in Korea that we gave Kim's mom and dad as a gift, so we hoped that they liked that. a wonderful day for you and your Korean friends; and, a wonderful read for me this evening. Thanks, Kevin and Ruth, once again for a great travelog. People all over the world are certainly kind and loving and generous; especially when they are with a wonderful representation of a Canadian married couple, who are willing and anxious to learn new things and have new experiences. Everybody likes to share his own little piece of the world. I'll keep following along. Hugs, guys! Thanks Mary-Pat! We love meeting local people on our travels and trying to learn as much about the country and the culture as we can. We have truly been so lucky on this trip to have met some many wonderful people that we are now happy to call friends. You guys are having a wonderful time with personal guides giving you the inside scoop on so much. That's one of the reasons that we love couchsurfing to staying at a hotel. You get the local experience. They are able to tell you where to go or not to go as they normally know all the secret places that the normal "tourist" wouldn't know about. We were really lucky here in Busan to have had locals who were able to take some of their time to spend with us, which just adds to the experience.